Done and dusted! 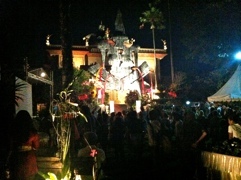 The 2011 Ubud Writers Festival draws to a close with a big shin-dig at the Blanco Museum. Not quite the white walls and empty room I was expecting…Come on, it’s called the “Blanco” Museum! Instead, we were greeted by an enormous statue and a monumental building enmeshed within an ornate exotic garden. Spectacular! 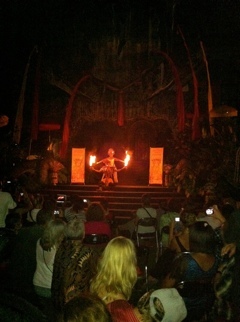 After the speeches, we were entertained by fire dancers and possibly the most amazing band on the entire island! Gotta find out who those guys were, because man, they were sensational. Lucky Oceans was a guest member on slide guitar, but the main singer had charisma, charm, energy, a booming throaty sound like velvet and blues and was an amazing trumpet player as well. A really awesome night to end out the festival.